Joni Mitchell wrote that profound lyric back in 1970 but remains as true today as it was the day it first hit the airwaves. While the author wrote about pressing environmental concerns, it’s equally applicable in many aspects of life; especially how a leader appreciates people. ap·pre·ci·a·tion – noun: The recognition and enjoyment of the good qualities of someone or something. You picked your team and filled it with highly ambitious A players. They’ve trained, worked and played with you through your company’s greatest achievements and most valuable learning opportunities. People are the lifeblood of your organization and your only true differentiator. By nature, we’re all emotional creatures, some more than others but universally we all want to be loved and appreciated. Recently, I spoke at Recharge 2014, presented by The Executive Roundtable. I was on a panel with some very prominent CEO’s that have achieved extraordinary results. My message to the eager crowd was about appreciation. I asked them when was the last time they hugged a teammate? They all gave me a shocked look. I went further and asked when was the last time they told a teammate that they loved them? Even more looks of shock. Why were they so shocked? Is a hug or message of love such an extreme tactic that it should elicit such extreme responses? Leadership is about love. Does your team feel a genuine love and affinity? Or is work for them just an all-day grind? Maybe you’re not a hugger. That’s ok but you need to express your appreciation daily. Here’s how I do it. Try to put yourself in their shoes. What are they feeling? How motivated are they? The only way to know for sure is to ask, so ask the right questions. Once you’ve asked the questions, don’t sit on the feedback, act on it! If someone tells you that they need something to make their day awesome, go get it for them. It doesn’t have to be a big grand gesture but when your team members see that you’ve listened and acted, they will feel appreciated. When you’re connecting with someone, how honest are you being? Some messages may not be fun to deliver but I believe my role as a leader isn’t centered around being easy on people but to enrich their lives. To do this I must be honest and transparent. This can be especially true when launching a new project. Have you made your expectations crystal clear? If you haven’t it will be tough for your team to exceed them. Once the project is completed make sure you provide candid feedback. It’s good to let them know what can be improved but vital to appreciate the effort and dedication they exerted. Acknowledging your team’s achievements is one of the best ways to show appreciation. Everyone likes to be appreciated for his or her work and as the leader a little acknowledgement will go a long way. It can be as simple as a thank you or even a high five; both cost nothing but a moment of your time. I advocate going further and creating rituals that publically proclaim your appreciation. One of the best ways we do this through our All Hands Meetings where we read aloud submitted testimonials that honor a person within our company. It may seem like a small thing but the smile on their face when hearing kind words about them broadcasted to all their friends, family and teammates is anything but small. Additionally, celebrate the milestones! When a team member’s big anniversary comes up, gather the team and have some cake. Acknowledged big events in your team’s lives such as wedding, births and family funerals. The chaos of a life-changing event may make them busy but believe that they will appreciate your effort. 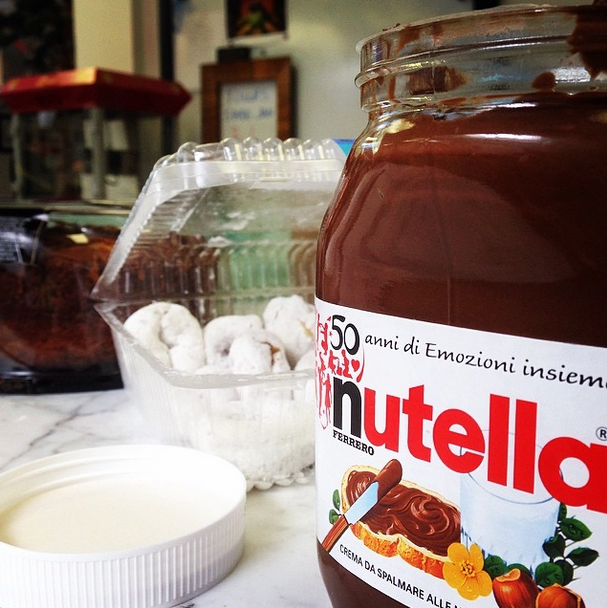 Who wouldn’t want to snack on some Nutella? Another way I show appreciation is by being a servant leader. If my team is staying late, I’ll be there with them. Even if I have to leave momentarily for an appointment, when I come back it’ll be with coffees, dinner or something to lift their spirits. Recently, I returned from a work trip to Italy where I was designing our next product release. I brought back a huge jar of genuine Italian Nutella. I knew the team would enjoy the snack but wasn’t prepared for the onslaught of smiles and thank you’s. It was a small gesture that showed that I’m always thinking of them and that I appreciate all of their efforts. These are just a few examples of how I show appreciation. If you’re interested in learning more, stop by for a Roma Tour and we’ll dedicate to time discuss how you can better appreciate your team. How do you show appreciation to your team? We’d love to hear about it in the comments section below. Awesome! Way to go Tony! Great read and some really good points! Well said Tony, this breeds a positive work place. An excellent blog! Thank you for sharing! One of the best blogs to date! We often are too busy with the day to day to stop and show appreciation but it goes a long way with our team members when we do it right. Excellent read. Well said Tony. “People are the lifeblood of your organization”. Understanding this concept is the most important factor in making a Leader into a Great Leader. Does it make a difference, absolutely without question. We will work harder, dig deeper and push farther knowing that our efforts are noticed and appreciated. I don’t expect to be appreciated because it’s my job, what I do. When you know that you are, it becomes more then a job, it becomes your passion. And that’s why I’m passionate about Roma. “Appreciation can make a day, even change a life, it can deepen the bonds between the giver and the recipient. Thank You Tony for another insightful and compelling blog! Great read, small gestures can create big rewards!!! Inspiring to hear! Love, is the reason we were born. Learning to Love, even our selves never stops! So many time the smallest of actions have the biggest of impacts. There is nothing more rewarding than feeling appreciated and cared for, thanks for sharing Tony! Love the part about servant Leadership! Too many leaders forget to lead by example and take care of the hands that take of them. Great blog! Without the people you work with, you have nothing. A house is nothing without the love and family inside it! Wow! So inspiring and a benchmark for everyone to aspire to. We sometimes loose sight of the fact that so much of our time every day is spent at work, which makes the workplace more of a second home or family as we interact with our colleagues every day. Roma is a second home for all of us who are fortunate enough to come there every day. Although I’m on the road most of the time, I feel so appreciated by the team and when I come by the office, I’m filled with love for my Roma family! Thank you Tony…great blog. I try to let everyone feel appreciated when I speak to them. I try to let them know that we are all in it together and their success is my success and vice versa. In 2015- my own personal goal is to focus more on the small gesture!